It's so IMPORTANT to take care of your LUNGS because it's SO HARD to replace them. The air quality in Lane County is really bad this year. People are suffering more than usual from severe colds and the flu. You can help eliminate viruses, molds, allergens and other pollutants from the air you breathe with an award-winning IQAir Filter. The IQAir HealthPro Plus room air purifier has again received Consumers Digest’s prestigious "Best Buy" award in the Premium category. The HealthPro Plus is featured in the magazine’s January/February 2014 issue in an article titled, "Breathe Easy: High-Performance Air Purifiers." The award marks the fourth consecutive "Best Buy" award for the highly popular room air purifier. "It is a great honor to receive a Consumers Digest Best Buy award four times in a row," said Frank Hammes, President of IQAir. "We work hard to continuously find ways to make the HealthPro Plus even better and to stay ahead of the competition." 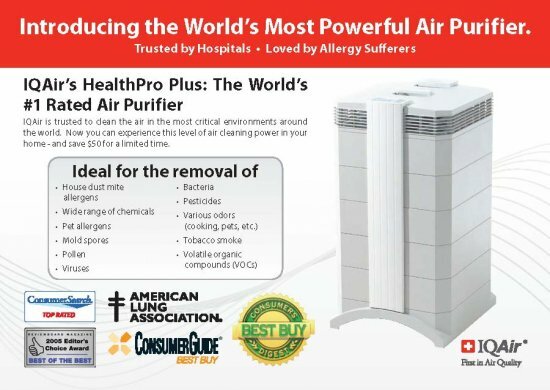 Consumers Digest said the HealthPro Plus remains the only air purifier with a five-year warranty, six fan speeds and four-stage filtration along with other features that are a "rare combination among air purifiers at any price." Consumers Digest evaluated the HealthPro Plus in its New Edition configuration that was introduced in 2012 and delivers up to 25% more clean air, up to 38% longer filter life and 32% less sound than previous HealthPro Plus models. The "Best Buy" designation is based on performance, ease and cost of maintenance, quality of construction and the coverage area that the air purifier cleans. The Consumers Digest staff conducts hands-on evaluation and research to pick the very best product. Manufactured in Switzerland and known worldwide, IQAir was chosen by the Hong Kong Hospital Authority to be used as a control measure after the the 2002 SARS outbreak. For our safety, and yours, we keep the IQAir machine running at Paramount full time, and I do the same with the one I have at home. It truly makes a difference. Let us show you how. 18-Months NO INTEREST Financing available at Paramount. See store for details.